If you have worked with any area of marketing and/or sales, you are familiar with the term “Sales Funnel”, but do you really know what that refers to? Depending on your background and experience, the funnel can be described in many different ways, and there are just as many opinions in the marketplace at how to best manage that funnel. Conversion funnels exist around many aspects of marketing, from digital marketing, to email marketing, to landing pages, and on to pure outbound lead generation. Today, we’d like to use our over 25 years of experience in the field to focus on the full Integrated Sales Funnel, which is designed to be fed by full integrated marketing tactics, by new prospects and existing customers, new markets and mature, industry marketing and account based marketing. We’ll break the funnel down a little further and help make sense of the various stages of the funnel as well as offer some tips on how to not only fill your funnel, but nurture those prospects and get them to the closing stage. 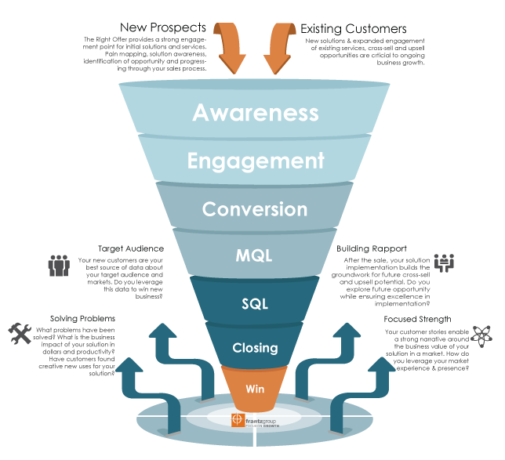 What exactly IS a Sales Funnel? A Sales Funnel is a measured, graphical depiction of the steps that take place during the sales process, or the various stages that are required to sell your goods or services. 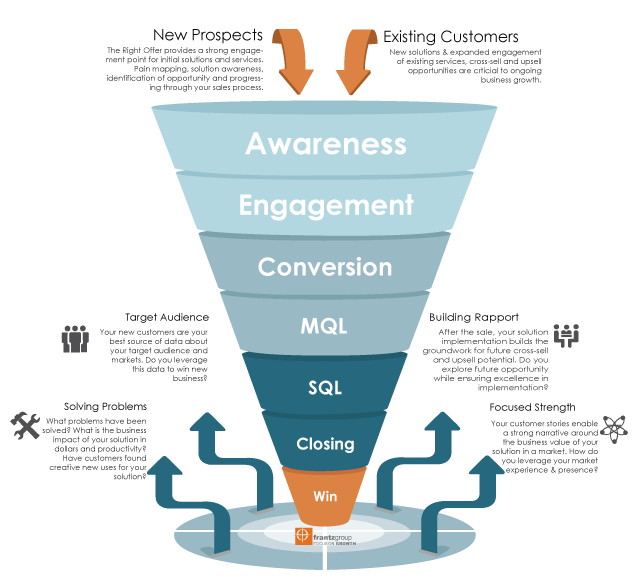 Ideally, your sales funnel should indicate the number of prospects that you have within each stage of engagement. The first step in building a solid sales funnel consists of determining the stages which will be a part of it. The upper portion of your funnel is generally known as your “Universe” or the “Top” of the funnel, it’s the place in which you will capture your initial contacts with prospective customers in the awareness and interaction stages. Once you have had the initial conversation with the prospect, and identified a need or pain point, they will start their journey through your funnel. Eventually they will move to a “Conversion / MQL” funnel position. This is also the time that much of your human contact and ongoing nurturing will kick in, which is a key element of the sales process to ensure that prospects are traveling the full path from initial interest, to an MQL/SQL or Marketing/Sales Qualified Lead, on to a proposal and finally to a closed deal, and a new customer for your organization. Without careful lead nurturing through the funnel, it’s easy for potential customers to get lost to competition in early stages, through simple neglect. There are many Sales Managers, Directors, and Teams that feel simply filling the funnel with a large volume of leads will ultimately result in a closed sale – however the key to truly reaching your sales and revenue goals is to not only fill the funnel at the top with qualified opportunities, but also to carefully develop and nurture them through the various funnel stages and ultimately convert them to a customer status. Now that you are familiar with WHAT a Sales Funnel is, let’s take a closer look at WHY you need to pay more attention to yours. What exactly is the benefit of even having a sales funnel and monitoring the various stages that your customers are in? Every organization knows that each prospect is not always an ideal fit for your product or service. Having a well defined sales funnel helps to weed through your prospects and determine who is the best fit and who has solid interest. A Sales Funnel can help your organization how to market to prospects based on where they currently are in the sales process with your organization. What is the average time from initial interest to a prospect reaching a closed deal status? Where are the roadblocks in your funnel? Are there places in which prospects get stuck or stop progressing? What are the characteristics of the target market that IS progressing through your funnel, what can you learn about your ideal customer? As shown in our integrated funnel graphic above, there are many opportunities to continue your business growth after the win. Strategic emphasis on learning from wins and losses to extend those lessons for key industries, pains, solutions and benefits is key towards continuous improvement for your marketing programs. Likewise, if you include key measurements for project success in your implementation cycle, you create more success stories for each vertical you pursue, as well as establish credibility with existing customers to move forward with cross-sell and upsell opportunities.